Use Case description – this captures what steps are done by each department in order to get the work accomplished in plain language so that it is easy to understand. 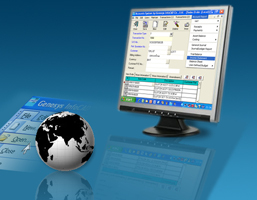 Screen Design – shows the menu, each data entry screen design, report design. We believe this is the information our clients understand very clearly and we focus on this. Process Diagram - shows the processes and, thus, forms to be done by each department. E/R Diagram – with each screen design we show the tables involved and their relationships via the entity-relationship diagram. Task Cover Sheet – this sheet is prepared by the project manager with a designated developer for each task and a tester for that task. This sheet includes the special points to test the software task which could be a special attachment if too long. It also includes the time log for the task, so that the total hours spent on that task can be logged. Task Test Sheet – this test sheet is specifically for the current task. It may include a test case if the form is complex to ensure that the software programmer does the testing first. If the form is simple enough the tester does the testing without a specific test case. Configuration Management (CM) Sheet. Here all the software components (usually forms and reports) that have been tested are kept with versions. All our modules must have pass the configuration management before delivery to the customer, which means a tester has approved it and it is ready for release. New software as well as change requests must go through the CM procedure. Development Status Report for Customer. We prepare a monthly status summary for the project to the customer. This is done after the software development work has begun until the software is completely delivered. Project Management Process. We have developed software for our own use to cover our project management needs. This project includes the project information entry, each task entry, project scheduling, project costs, invoicing, receipt, and payments. It provides us with information on the exact project cost so we can monitor our bottom line. This software is summarized in the next section. Site Visit Form – this form is completed each time we visit the customer site. It requires the customer signature as well. Work Request / Bug Report Form – we fill this form when we get a bug report or a change request. The exact format of the form is not necessary, since we often do this electronically. However, it is important that the form number be logged and tracked for progress. Change Request Attachment Form – after receiving a change request, some analysis of the needed changes may be needed and a task description form is generated. Sometimes, the change request is summarized in the attachment form as well. Customer Communication Form – all our communication with the customer is also logged and filed. Each memo and minutes of meetings are sent out after any important development. User Training Manual – this includes a short manual describing a training session with sample training data set up just for the training and implementation phase of the software. User Manual – this describes the entire software with the interface description, menu, each form, and answers to questions on "how do I". Technical Manual – this describes the software for the programmer. We include a screen dump of each form along with the tables in that form and their relationship expressed as E-R Diagram. At the end of this is the data dictionary for the entire project’s database. We maintain this manual all along as the software may have changes during the implementation and maintenance phases. When this document has too many hand-written changes, for example, due to many added fields by the user, we print a new version. Project Completion Document - This is the same as the Project Status Document shown above, but used to close the project. Maintenance Contract – This is a contract detailing the start and end dates of the maintenance. It also shows the price and the servers covered in the maintenance agreement. Copyright 2007 Genesys Infocad Co., Ltd.